Document Retention (Document Destruction) policies are easier to manage when you let the File Butler automatically delete unnecessary files. Reduce your risk for legal troubles. Free up hard disk space. Run backups faster using less backup media. Make your paperless office system work smoother. Put "expiration dates" on your files! Automatically get rid of those files after the expiration date. This program is critical to automating Data Life Cycle Management (DLM). Order & Download Now! Special discounted price through 4/27/2019 $49. Regular Price $59. (2,383 KB Approx. 1 minute download) 30 DAY UNCONDITIONAL GUARANTEE! Lets face it, retaining documents isn't the problem. We automatically retain documents. It is simple to retain documents. The real problem is document destruction. Document retention is easy. Document destruction is hard. The File Butler makes document destruction a snap. Determining how long to keep documents is the focus of most document retention discussions. Actually, determining the deletion date is the easy part. There are lots of excellent guidelines on when obsolete documents or obsolete files should be deleted. Finding the time to delete the documents is the real problem. Finding the time to delete old documents is a major problem. Why? "The job is done." "People are working on more important issues." "No one has time." "It was going to be done when work got slow, but the level of work never got slow." The computer gets loaded up with unwanted files. You will need a new computer or hard disk upgrade sooner. Requirements for more expensive tape backup systems. Greater difficulty finding documents that you need. By the time a computer file should be deleted, it may be hard to tell when that file can be safely deleted. The person that has to do the grunt work of a search - and - destroy mission to locate obsolete files will not enjoy the work. The DTS File Butler solves this problem. Simply add the deletion date to the filename when the file is created. After all, the person that creates the file probably knows best when, if ever, it should be deleted. Run the File Butler over a coffee break, lunch or at night. The File Butler will quickly either delete or move obsolete files. Include the deletion date in the filename. Furthermore, add a prefix to the deletion date to avoid any confusion. We recommend a deletion date prefix of "del-". Example. Lets say your Document Retention policy for monthly broker statements dictates that they should be deleted after one year. (This might make sense if the broker issues a year - end annual summary that includes all transactions for the year.) You might want to use a filename of "stmt 03-31-2003 del-03-31-2004.pdf". In this example, one can tell that this file can be deleted after March 31, 2004. 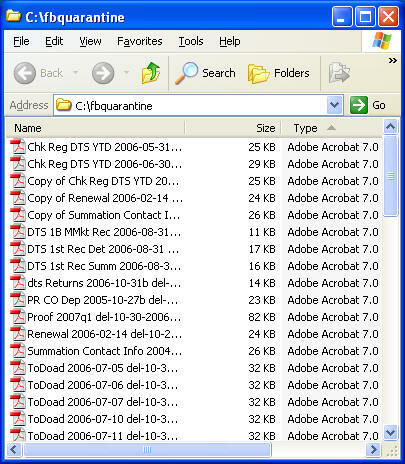 Even better, with the DTS File Butler, your computer can automatically remove this file after March 31, 2004. Adding the document retention date to your paperless office files is fairly simple. You still have one of the most time consuming problems unsolved at that point. Even though you are including a deletion date with the filename, you will still need to use Windows Explorer to hunt down and delete the files. That makes your paperless office a little more costly. The File Butler will automatically hunt down and delete those files for you. It is really just that simple. Hit the Run button. The program will search through your C: drive for obsolete files to either delete or move. You can run this over a coffee or lunch break. You can run it after you have left the office. You can also run File Butler from the Windows Scheduler. Our instructions shows you how to easily set this up. You can schedule File Butler to run every night, once a week or once a month. It is your choice. The program lets you decide whether File Butler should automatically delete the old files or move them to a "quarantine" folder. Deleting the old paperless office files is the fastest and easiest choice, but it is not the safest choice. When you choose to have the File Butler move the obsolete files to a "quarantine" folder you have one more chance to double check whether the files should be deleted. The program also looks for obvious problems. Read-only files won't be deleted. Files with file creation dates AFTER your deletion date won't be deleted. If there is any question whether or not a file should be deleted, the file won't be deleted or moved, but a warning report will alert you to the issue. Integrity of your system is the number one priority. Download the demo, dfb0310.exe, for this program.